Michael Laverty battled to an 18th place finish at the 15th round of the MotoGP championship in Motegi, Japan. The Toomebridge rider languished down the order in free practice and qualifying did not go to plan either. The Paul Bird Motorsport pilot lies 26th in the standings with three rounds left, having picked up just one points score in securing 14th at Indianapolis. Spaniard Marc Marquez retained his world title by taking second position in Japan on his Repsol Honda. The 21-year-old became the youngest ever back-to-back champion in the premier class as he clinched his second world title on the Motegi track. Repsol Honda rider Marquez won the title with an unassailable tally of 312 points in the overall standings ahead of the final three races in Philip Island, Sepang and Valencia. 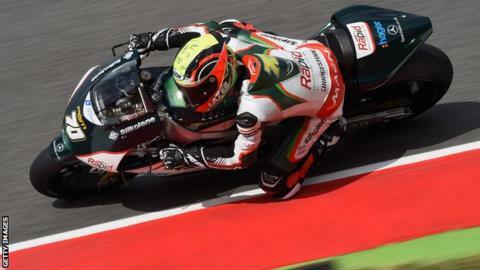 Laverty, riding an Aprilia ART-powered PBM, is 12th in the Open class, four places behind team-mate Broc Parkes. Spain's Jorge Lorenzo won the race 1.638 seconds ahead of Marquez with Italy's Valentino Rossi third.